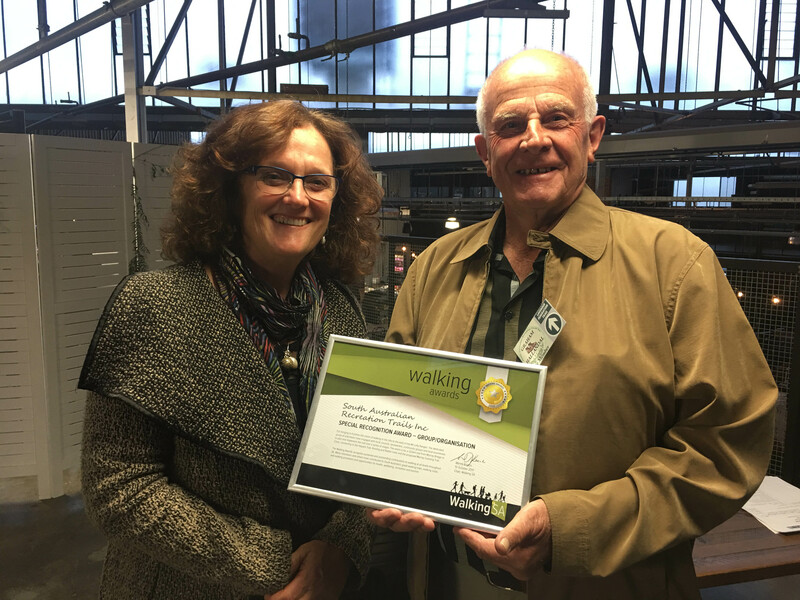 South Australian Recreation Trails Incorporated (SARTI) has been building walking trails since 1999. The major project of the 100% volunteer group has been the Lavender Federation Trail. The Lavender Federation Trail is now an established part of the walking trails network of South Australia involving many thousands of hours of work by a small, dedicated group of volunteers. The concept of the trail came into being after a group of walkers began to look for interesting walks in the hills to the east of the Mt Lofty Ranges and found to their surprise a wealth of good walking country. With high ridges, dramatic gorges, stately peaks and sweeping panoramas never explored by walkers before. This resulted in a series of public meetings being held which resulted in the formation of SARTI (South Australian Recreation Trails Incorporated) and the establishment of a volunteer Management Board. The aim of the SARTI Board was to build a trail from Murray Bridge to Clare and on the way, passing near small towns so they may enjoy economic benefits from users of the trail. Originally called the Federation Trail to celebrate the centenary of Federation in 2001, it had its introduction to the public in September 1999 when around 200 walkers traversed a section of the proposed trail from Murray Bridge to the Monarto Recreation Reserve. After the death of Terry Lavender, the first Chairman of SARTI & a strong driving force in the trails establishment, the trail was renamed the “Lavender Federation Trail in 2004. The policy of SARTI from its beginning was to have representatives on the Board from local Councils as well as representatives from the walking community. The support from all five Councils has been exceptional both in monetary and in “in kind” support. The policy of SARTI is to work closely at all times with local landowners & keep them fully informed. Before a new section of trail is commenced, the local Council sends a letter to all landowners adjacent to the proposed route of the trail with SARTI contact details if they have any concerns. The cooperation of local landowners has been excellent. Initially, some are naturally skeptical about strangers walking along unmade road reserves adjacent to their property. After a section of trail is opened however, most welcome the extra “rural watch” assistance & find walkers take care of the outdoors they enjoy and some are now our biggest supporters. Much of the Lavender Federation Trail traverses private land with the approval of the land owner. On one section of trail between Dutton & Eudunda, the local land owner offered their property as access for the trail, built the trail and will maintain it. The object of the SARTI Board has always been to route the trail as near as practical to smaller rural towns thereby giving an economic benefit to area. Many hotels, accommodation facilities, restaurants and food outlets adjacent to the trail have reported increased trade that they can attribute as coming from walkers using the Lavender Federation Trail. Several large groups, some traveling from other states, have walked the entire trail in one continuous walk over several weeks utilizing local accommodation and facilities each day. Articles contributed by participants have appeared in several national walking and outdoor magazines. When a new section of trail is opened, local organizations are invited to take part in the organizing and running of the event. Local volunteer organizations cater for those attending thereby raising funding for local projects and local businesses set up displays, Usually around 200 attend these openings. The opening of the Truro to Eudunda section of trail opening event was a recipient of an Australia Day Award for the best community event in the Goyder Council Region in 2015. Trail construction for 2017 is now well underway. It is planned to construct a section from Manoora to Mintaro and then onto Watervale in the Clare Valley by the end of 2017. At Watervale, the Lavender Federation Trail will connect the Riesling and Rattler trails to the Heysen Trail thereby opening around 1700 km of continuous interconnected trails together. From Watervale the Lavender Federation Trail will head north to Clare via Spring Gully Conservation park, its planned finishing point, 320 km from Murray Bridge. At Murray Bridge a section of the 450 km Murray Coorong Trail will share part of the Lavender Federation Trail.